Complete Finnish is a comprehensive language course that takes you from beginner to intermediate level. This ebook contains text only and no audio content. 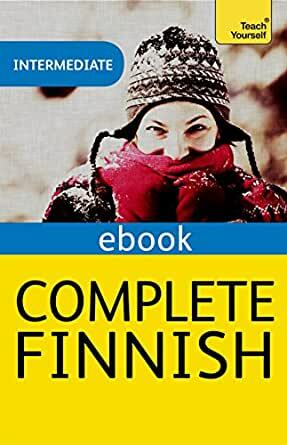 The best-selling complete course for a fun and effective way to learn Finnish. This ISBN is for the audio support component. The corresponding paperback book (ISBN: 9781444107135) is also available. The book and audio support can also be purchased as a pack (ISBN: 9781444107142). I have a huge desire to go to Finland some day. It is a country that fascinates me, mainly because of the culture and the language. This Teacj Yourself course seems to go step by step on the way of training the student, and it works perfectly on my iPad. Very nice, indeed! It's the now classic Terttu Leney book. My previous one from 2004 was called just Teach Yourself Finnish, but all the readers are the same. There is some additonal material now, such as short paragraphs in English on life in Finland and some vocabulary builder lists. The grammar goes well into everyday use and you can certainly speak Finnish if you know that much of the grammar and know the vocabulary. I had this book when I was teaching my kids Finnish in the US. My son went on to take other classes (summer camp) and eventually a 200 level college class in Finnish. The current version also replaces the old fonts and headings and layout. I think it was actually fine before, and still is not bad but there was no need to change it. The illustrations are the same as in the original book. Well, on page 42 we have euro bills, they might have been markkas back in the 1990s. All in all, Finnish usage is well explained without getting into too much into grammar terms. The cases of nouns have to be named and explained, there is no way around that. Finnish verbs have quite complicated grammar and some of that is explained in text and examples. The index does not even list "participle", a basic part of more advanced Finnish grammar. There have been good books printed in Finland for foreigners, some in English, but they tend to be hard to find from abroad, Also, the modern classroom practice is to explain all in Finnish with perhaps study guides for a few foreign languages. Without a teacher, those are not much use. A few other American texts for the beginner have been around, but I can't say they are better. I've been involved in this somehow for 30 years and I have to say my most favorite book (in English) ever was the Aaltio pair of Finnish For Foreigners 1 and 2. It survived a few printings in Finland past 1990 but I think has been passed by other books. It is still listed in on line bookstores in Scandinavia. Akateeminen, Finland's best book store, has gone downhill and the on line store disappeared. The Aaltio book is in one on line store for 36 euros. The part 2 book goes a little beyond this Leney fine effort, it simply has more advanced material to get you to read newspaper level text. Summary: no better book is available for the beginner. Finnish is best learned with some personal exposure to the country once you finish the Leney book. I will be working in Finland for two years and I purchased this book to begin learning Finnish. I haven't used any of the competitor books, so I can't make a direct comparison, but as a whole I was impressed by this book. It is thoughtfully and competently written. There is emphasis on good pedagogy, where grammar is introduced in bite-size pieces through meaningful conversational settings. The book covers the usual foreign language topics: greetings and introductions in the first couple chapters, then continuing with time, directions, food, travel, hobbies, etc. in later chapters. Each chapter begins with a few notes on Finnish culture. The heart of the book is various model conversations (with audio recordings on the accompanying CD), which form the basis for the vocabulary lists and the exercises. There is an answer key at the end. It is a compact book, shorter than its listing at 448 pages would suggest. The book has slightly more material than what I'd expect to be covered in a semester-long introductory college course. In this sense this is definitely a beginner's book. The grammar is never presented in any "final" form, not even as an appendix, which also puts a ceiling on the book's usefulness. That's the reason the book doesn't get the full five stars---it doesn't feel as complete or authoritative as it could be. Some other reviewers seem to have complaints with the Kindle edition, but naturally such complaints wouldn't apply to the print edition. The book comes with a CD with basic but adequate listening tracks, which should work on any computer. Overall, it's a great book to help a beginning learner get out the gate and reach a basic level of conversational proficiency. Most complete offering at Amazon for those who want to learn Finnish. I had previously purchased the non-enhanced version of the book for the kindle app on my ipad and was relatively happy. The book itself is excellent for an intermediate level teaching grammer and syntax in the context of everyday situations. However, I had to keep going from mp3s stored on my iphone to the kindle book on the ipad which was cumbersome and tended to discourage one from making use of the sound. I had often thought it would be way better if your could just push the sound icon when you needed a passage or a lesson read out loud. The enhanced version does just this which greatly facilitates and speeds learning. I knew a tiny bit of Finnish, which is an advantage. I was a language teacher, and found the instruction excellent. However, it is not easy, and you have to work at it. Using free mobile apps are good supplements, but do not explain the grammar like this book does. My only problem with the book is that the print is small and light. I found myself enlarging portions of it. I researched a bit and found this book highly recommended.